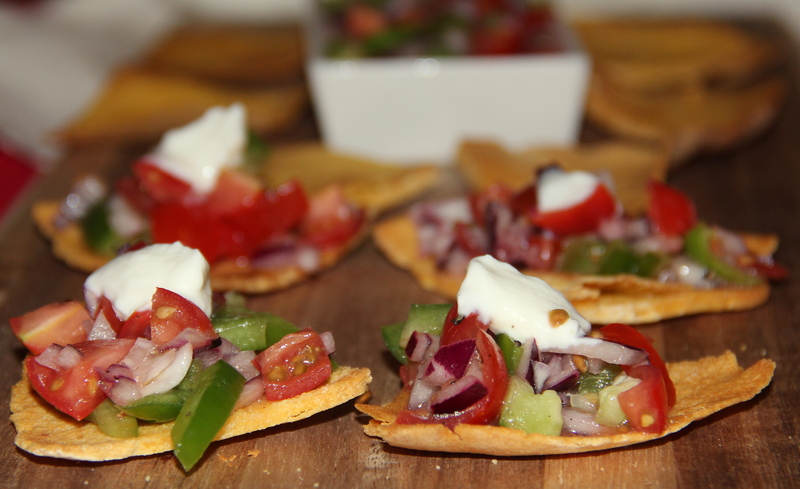 Tortilla Canapé are the perfect party finger food and are great appetizers that your guests will love! Canapé are spectacular when served with creative fillings. I tried filling them with fresh Cherry tomatoes, Bell pepper, Jalapenos and Onion with Geek yogurt topping. Pre-heat the oven at 180deg, line the baking tray and set aside. Combine cherry tomatoes, onion, bell peppers, jalopenos, in a bowl and drizzle salt, ground black pepper, olive oil, lime juice and give it a toss until combined. Make this salsa ahead and Refrigerate for 1-2 hours . When ready to serve, top it up with salsa and enjoy. Any combination of veggies/beans can be included as a variation. Posted on October 9, 2014, in Appetizers, International, Kids recipes, Salad/Wraps and tagged Mexican recipes. Bookmark the permalink. 53 Comments. These look fresh and yummy! They look like the pefect little snack. Love it! Healthy option for snacking ! This is soo delicious !!! Beautiful and tasty appetizers. In fact, I could just have a few and call it supper! Thanks for the link also to the tortilla chips. I’m sure the home-made ones just make this appetizer even more special. great finger food idea…..looks delicious Chithra!